I solved the following problem from by book, but the answer of this problem at the end of book is $x \leq 3$. Please tell me how I can get this answer. 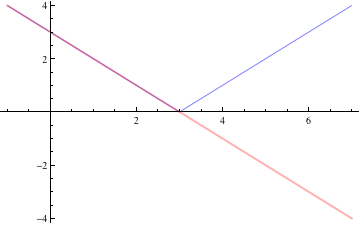 edit: As a further explanation of the problem as a whole, consider the graph below, where $|x-3|$ is shown in blue and $3-x$ is shown in red. The graphs coincide for $x\le 3$ and the blue graph is higher for $x>3$, so the original equation is true for $x\le 3$. You are given $|x-3| = 3 - x$. Now given a real $x$, either $x>3$ or $x \le 3$. So we split into two cases. Case 1) $x > 3$. Then we have that $x-3 > 0$ and so by definition of absolute value, $|x-3| = x-3$. Since we assumed $x > 3$, there is no solution to your equation. $|x-3| = -(x-3) = 3-x$. $3-x = 3-x$ which is true for any $x$ (but keep in mind that we are only considering $x \le 3$). Hence any $x \le 3$ satisfies this. 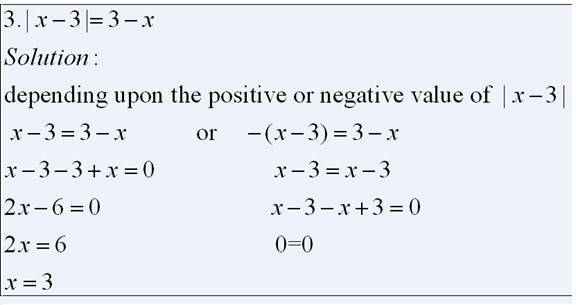 Combine the two solutions for both the cases and you get $x \le 3$. $x = 3$ or $x < 3$. If you combine the two, you can say $x \le 3$.